This information is meant as a general guide. Further and more detailed information can be obtained from any of the books mentioned at the end of this article, all of which are highly recommended. In previous Bulletins instructions were given for catching and killing insects. Many people have said that it is all very well collecting, but what do we do with the specimens when we get them home if we have no equipment? The following contains condensed information on the various equipment required if you wish to do things properly. However any further ideas will be gladly received by the Group via the Insect Recorders. Insects should keep in good condition indefinitely -- the essential requirements are dryness and either air-tight boxes or a suitable preservative. One can start a collection of, say, Butterflies, with nothing more than a strong chocolate box with a well-fitting lid and a few wine corks, cut into slices and glued to the base of the box in rows. This does not lend itself to good display but is perfectly adequate for storage. It is also advisable to glue one or two naphthalene balls in the corner to keep out mites. Infection of specimens can be a problem and mites or museum beetles can destroy a collection in a short time. The first signs are small amounts of "dust" collecting under the specimens. Insects may be exposed during drying out but at this stage bodies of moths will smell, especially the large ones (Hawks etc. ); although this is not always detectable by the Collector it will attract mites or museum beetles. These can be kept at bay by storing the specimens in a cardboard box with some insect deterrent but there is one precaution that should not be overlooked -- never transfer straight from the setting boards to your permanent storage box as an infected specimen may be introduced and the trouble may spread. There should always be a "half-way house" for temporary storage and sorting before fixing the final data labels. 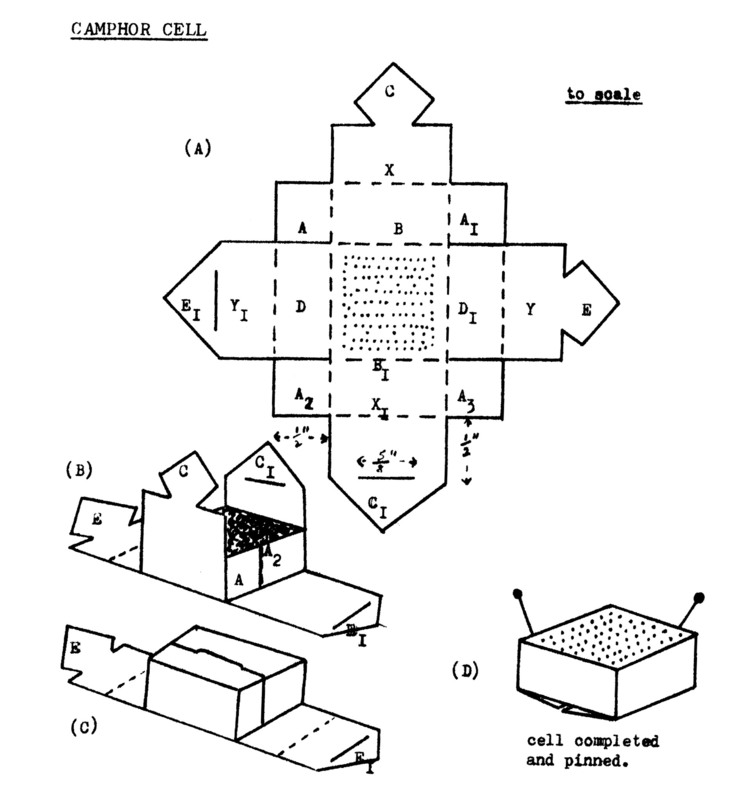 A "camphor cell" is usually made to hold the insect deterrent. Camphor was once used but it has a strong tendency to make those insects that are inclined to turn greasy become so more quickly. Camphor balls and naphthalene balls are two quite distinct substances. Confusion is sometimes caused by shops calling naphthalene balls 'camphor balls'. 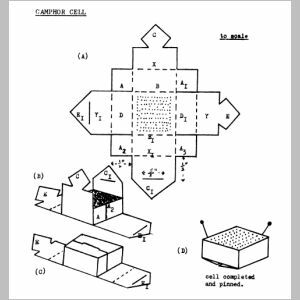 A diagram is given for the construction of a camphor cell. Naphthalene balls can be used on their own if you do not wish to make a camphor cell. It is safer to wrap one in fine muslin and then pin it. Alternatively you may heat a stout pin in a flame and when it is practically red hot, plunge the head into a naphthalene ball. It will melt its way in and the melted portion will solidify in a very short time and seal it in. However, there is a possibility of the ball breaking loose and making a track through your box of insects when you tip it up so it is even better to use flaked naphthalene. This also has a greater surface area and gives off stronger fumes. Naphthalene will keep the pests away and lasts quite a long time. If however, you already have the mites in a collection then paradichlorbenzene will actually kill them, but it evaporates quickly so use naphthalene for a long-term deterrent. If you use too much naphthalene and there is a sudden drop in temperature the naphthalene may crystalise and will appear like frost on wings and bodies of specimens. Do not attempt to remove the crystals. Take off the lid and allow the naphthalene to evaporate. This may take up to 24 hours. Mould is also a danger to a collection. If specimens are put in store before they are dry, or the boxes are kept in a damp room, mould may form on the bodies; it will spread to the wings unless treated. Mould can often be removed from the wings of butterflies with a fine brush. If a dry brush won't work then one dipped in carbolic acid (phenol) may be better. When lifting mould from insects, don't forget that the scales overlap on wings and bodies like the tiles on a roof, so work along in the direction in which the scales lie so that you do not dislodge them and so damage the specimen. Mould can be prevented to some extent by the use of beechwood creosote. Only a few drops need be used but it may stain the floor of the box or cabinet. It can either be placed on a small piece of cotton-wool and placed in the camphor cell or the cotton-wool ball may be mounted on a long pin and pinned into the corner of the box. Sometimes specimens become greasy long after they have set. The use of ethyl acetate as a killing agent is sometimes responsible as it reacts on body fat and causes it to dissolve; some specimens become greasy even if other killing agents are used. Whatever the cause greasing discolours the body and possibly the wings. To de-grease, the specimen needs to be pinned to a small cork mat which is lowered -- with the specimen attached -- into a reasonably deep dish containing a solvent for grease. The specimen must be immersed. Toluene is the best solvent to use, but you can also use carbon tetrachloride, ethyl acetate or benzol. The mat may be kept submerged by placing a weight on it, such as a well-scrubbed beach pebble. Allow the specimen to soak in the solvent for a while until the grease is removed, but if the solution becomes dirty you must repeat the process using fresh solvent. After treating the insect is dried by exposing it to the warm air of a room when its normal coloration will return. If grease from the specimen has stained the base of the store box the affected area must be wiped over with a wad of cotton wool moistened with the solvent. When using solvents it should be remembered that some of them are highly inflammable and some give off a heavy vapour, so de-greasing must be carried out in a well-ventilated room and never near a fire or naked flame. Another method of 'dry-cleaning' insects to remove grease is to rest the insect on a small bed of Fuller's Earth and sprinkle a little more on top and over the wings. Leave it for about two weeks and on removal, gently blow away any remaining dust. This takes time but has the advantage over other methods in that the edges of the wings do not become matted where butterflies and moths are involved. Setting an insect is quite simple once the principles of relaxing are understood. Before setting an insect it is necessary to restore moisture to the body. If an insect is killed by a method other than one involving Ethyl Acetate or Laurel (see Bulletin No. 13), it will generally stiffen after death. This prevents the wings from being opened for setting except by force, also the legs become brittle and they are usually closed underneath the body. There is a natural period of some 12 -24 hours after death when the stiffness does disappear but it is difficult to gauge this. The solution is to place the specimen in a relaxing tin -- a flat container with a suitable absorbent pad on the bottom and containing a commercial relaxing fluid. As the latter cannot be obtained in Abu Dhabi, one of the easiest and cheapest ways of making a relaxing tin is to take a small aluminium or plastic lunch-box and place within it a layer of sand or several layers of flannel or blotting paper dampened with BOILED water. When using boiled water as a means of relaxing, the tin must be checked frequently for any sign of mildew. If this is present the specimen must be removed and the affected area painted with a very fine brush using a mixture of ten parts benzol to one part carbolic acid. Chemists in England will prepare this for you -- they may do so here as they are generally very helpful -- however, I have never had to use this so cannot give any further details. If the mildew is still present after a while you should give it a second painting but if the mildew persists then the specimen should be regarded as useless and destroyed. Again, the mildew may be overcome by keeping thymol (thyme-camphor) or solid naphthalene or paradichlorobenzene or a few drops of phenol in the tin. Commercial relaxing fluid is very good and quite inexpensive -- the name and address of a supplier can be provided. Any odd legs or parts of insects should be removed from the relaxing tins as these will in time turn mouldy and become a dangerous source of infection to other specimens. An allowance of 24 hours is the general time given for the specimen to be sufficiently relaxed to set. However, this will depend on how long ago the specimen was captured so it may take longer -- say 2/3 days. Cotton wool should be avoided at all times when killing or relaxing insects. The legs get entangled and will consequently be pulled off. The tin should be allowed to stand for at least an hour after pouring the liquid -- approximately two teaspoons -- and the lid replaced. Papers containing specimens are opened up slightly and laid on the damp surface and the box closed and placed in a cool place for the 12 -24 hours. The specimen should be sufficiently flexible for setting but to test it you should hold it with forceps beneath the thorax in the area of the legs and gently blow on the wings. If these open fairly easily the insect will be in a suitable condition for setting. If the insect is wingless then the legs will move at the joints when brushed gently with a very fine paint brush. If the specimen is not ready return it to the tin for a little longer. After use the wet sand must be thoroughly dried or the flannel or sponge scalded and thoroughly dried and the blotting paper replaced. Studying Insects. A Practical Guide by R.L.E. Ford. Collectineg, Preserving and Studying Insects by Harold Oldroyd. Collecting from Nature by T.J. Jennings B.Sc. * Available in the Group's Library. Copy the plan accurately onto a sheet of stiff white paper, and cut along the bold black lines, The dotted lines are for folding and should not be cut. Before folding, take a pin and make numerous holes through the paper over the stippled area on the plan (centre square). Now fold along lines of flaps A - A1, A2 - A3, and in the same direction as these folds were made, continue by folding lines X, X1, B and B1. Within the square formed place a quantity of naphthalene and tuck the point of flap C through the slit in flap C1. To complete the cell, fold along lines D - D1, Y - Y1 and tuck the point of flap E into slit E1. Turn the cell over and insert a long entomological pin through two corners, and pin the cell into a corner of the store-box.